Last December I stepped down from my role as Executive Director of GOALS Haiti to prepare for graduate school. The immensely talented Haiti-based team, led by Jolinda Hackett, has brought the organization to new heights. The programs have improved, the impact has grown, and the organization has become stronger than ever. It is enormously gratifying to see them succeed in such a big way. GOALS is preparing to release its 2014 Annual Report, marking our fourth year of making a difference by empowering Haitian youth, families and communities. We’re well on our way to having our best and most impactful year yet here at GOALS. Sometimes, it’s easy to see the incredible difference GOALS makes. After all, every single day more than 400 kids eat healthy meals and play soccer and 45 kids attend school, thanks to the support of our generous donors and our dedicated local staff. Sometimes, the impact is subtler, but just as important. We’re coming up on almost two years without a single teen pregnancy at GOALS, for example, which is an incredible achievement compared to teen pregnancy rates nationwide. This is remarkable proof that with confidence developed on the soccer field and increased access to health care and health education, young people will make positive changes in their own lives, with lasting effects. GOALS proves that given the chance, youth have the power to create a better future for themselves and their communities. We just provide the opportunity. Empowering individuals, soccer teams and communities to create their own positive changes. So, what have we been up to so far this year? This year, we launched a new literacy program in the village of Destra, where many kids are unable to attend school. Three days a week, 20 kids are learning to read and write at GOALS, and of course, we play a few fun learning games, too. 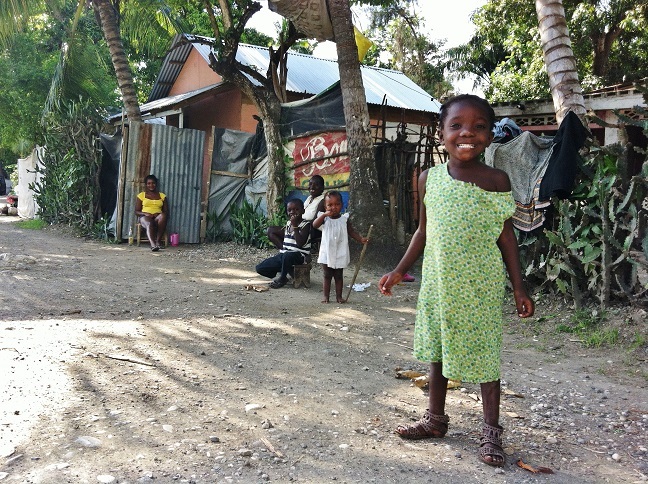 Nearly all of the adults in the village of Destra are extremely low literate. With GOALS literacy classes, we hope to see the day when none of the kids are illiterate. Lofty? Yes. Possible? Very. In March, we partnered with Waves4Water, to provide a simple, portable and easy to use water filtration system. 600 people are now drinking clean water every single day in Destra. Terrasonson, our newest site, has been working hard to achieve all the benefits of the GOALS program. They’ve planted a vegetable garden, attended a special “girls-only” clinic day at our partner clinic and the Terrasonson coaches worked hard to develop a three-part health curriculum combining serious lessons with fun soccer games to help the girls learn to make good choices and take charge of their health. Our Bossan teams have a new compost project, thanks to help from some community volunteers! The team captains leads their teammates in watering and turning the compost pile every few days, and they’ll add the compost to their community garden soon. Bossan also played in our first-ever mixed gender soccer match. It was a close game, and the crowd went wild. The best part of all was watching so many boys and girls play together on the field, demonstrating that girls and boys can both do anything! But all this fun is not a gift. Kids, parents and communities give back by supporting the program and through ongoing community service. Earlier this year, several GOALS kids visited an orphanage, where they helped out by fetching water, braiding hair and cleaning dishes (and playing soccer with the kids too, of course) and our soccer teams have collected hundreds of plastic bottles to be recycled through our recycling partner. Soccer teams tackling difficult development issues, with youth leading the charge to create lasting change. These are some pretty amazing achievements in just the first half of the year. While we’re always proud of our youth, just as important is how the GOALS program develops strong community leaders, and we’ve seen our coaches grow so much this year! Our team of coaches in Destra organized and distributed the Waves4Water filters in their community completely independently – not an easy task! We’re also proud of our alumni who have been volunteering their time at literacy class, providing one-on-one help for the kids who need it most. Coach Walker has been saving up to enroll at a university in Port-au-Prince, where he started attending classes part-time, and coach Nadege went back to school this year to get her high school diploma – not an easy task as a mother, a foster parent for her nieces, and a GOALS coach. We’re proud to have such outstanding leaders and role models on our team! It’s an incredible experience to be a part of all these changes here on the ground in Haiti, but of course, none of it would be possible without the support of donors and supporters such as you. So on behalf of our talented kids, dedicated coaches and local staff, thank you for believing in GOALS and for investing in a better future for kids in Haiti. Next Next post: Four years later: Can you hear me now?